Beauty is in the eye of the beholder, and obviously none of the judges at the annual World’s Ugliest Dog Contest in Petaluma thought that a 17-year-old blind Chinese Crested Chihuahua miniature mix had any beautiful attributes. That’s why the judges on Friday picked Sweepee Rambo, owned by Jason Wurtz of Van Nuys, California, as the 2016 winner. They noted her lolling tongue and hairless coat as some of the characteristics that landed her the homeliest prize. 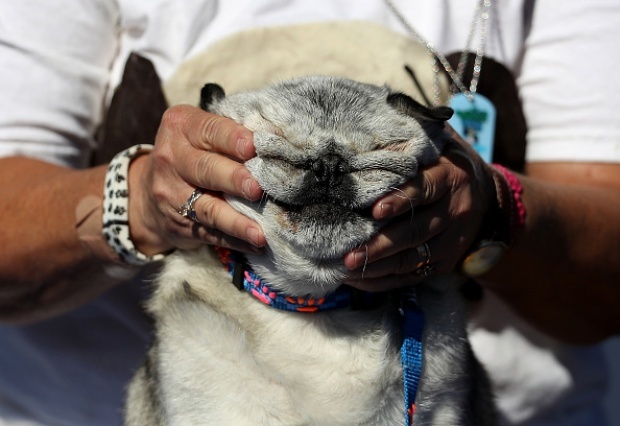 Sweepee beat out 17 other unbecoming dogs in the annual World’s Ugliest Dog, which has been held in California for more than 50 years, 28 of them at the Sonoma-Marin Fair. “We celebrate the spirit and imperfections that make these dogs loveable and adoptable,” the fair’s marketing director, Karen Spencer, said in a news release. The Santa Rosa Press Democrat noted that this was Sweepee's third time at the fair, and that one of the judge's gave the pooch extra points for a sore oozing on her leg. The prize includes a trophy and $1,500.